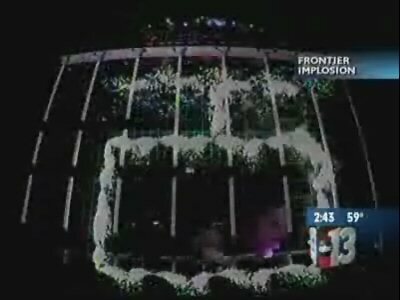 March’s Stardust implosion had really cool animated numbers in the windows of the building counting down the time to death. The New Frontier took it a step further with an awesome animated plunger on zero that pushed down to start the demolition. 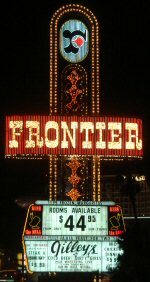 The New Frontier is set to fall at 2.30am Vegas time. That’s 10:30am GMT so I’m hoping to be able to watch it live on www.ktnv.com. They’ve promised a live web stream. 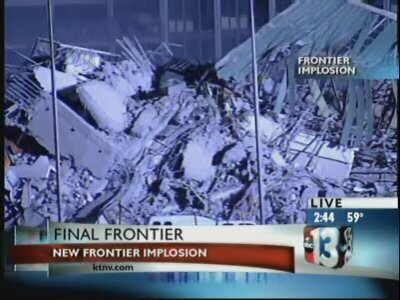 Meantime, here’s the news coverage from the first Las Vegas theme hotel’s last full day on the planet.